A 400+ page coffee table book featuring the largest collection of Ralph McQuarrie's art ever published. Best known for his instrumental contributions to the making of the original Star Wars trilogy, Ralph McQuarrie has inspired several generations of film fans and artists. While much of his Star Wars artwork has been reproduced in numerous volumes over the years, his non-Star Wars work has previously only been available in The Art of Ralph McQuarrie, a limited edition that we published in 2007. With The Art of Ralph McQuarrie: ARCHIVES, we will bring back into print a career-spanning retrospective of Ralph McQuarrie’s non-Star Wars artwork. At 13” x 9.5”, this 432-page volume contains more unseen art than what was in the original edition. That's hundreds of Ralph McQuarrie illustrations spanning all aspects of Ralph's career. 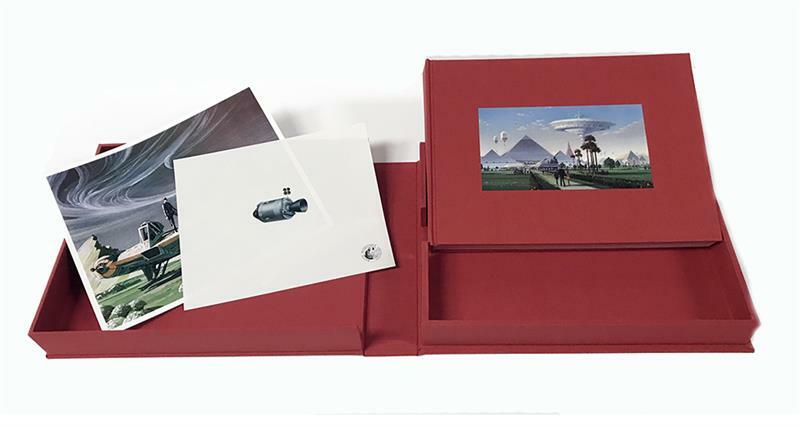 The deluxe traycased edition is limited to 450 individually numbered copies, and includes two exclusive bonus items: First is a reproduction of one of Ralph's animation cels on acetate featuring the Command and Service modules of the Apollo spacecraft, reproduced in 1:1 scale of the original. Note that in the picture below you're seeing it against a white paper backing. The second is a print of Ralph’s production painting of his early concept Viper on the surface of Carillon (a piece not included within ARCHIVES).